A dispute between regional airline Horizon Air and its pilots union is headed to court. It stems from how the sister carrier of Alaska Airlines grapples with an industrywide shortage of pilots. The Teamsters union represents Horizon Air pilots. It went to federal court in Seattle on Friday to ask a judge to rescind $10,000 signing bonuses that Horizon Air has started offering new hires. So why does the union want to cancel hefty bonuses? "As a union, we represent all pilots,” said Captain Jeff Cox, who leads the Horizon pilots group. “If you give a chunk of money to a very small, select group, then you are depriving the other pilots of compensation and equal treatment." The Teamsters union asserted in its legal complaint that the bonuses for new hires cannot be introduced unilaterally. The court filing went on to claim that Horizon management was "circumventing" the collective bargaining agreement in "an effort to fundamentally undermine the Union." Cox said the union proposed what he called a "comprehensive" solution with higher pay and retention incentives for all pilots, but management turned that down. "After months of negotiations with the pilot union, Horizon Air will continue to work toward a solution that’s attractive to new pilots, while respecting the contributions of existing pilots and the competitive regional airline marketplace," an Alaska Airlines/Horizon Air spokesman wrote in an emailed response. Cox said the pilots are prepared to call a strike down the road if they perceive that the airline's management continues to "violate" the union contract. Pilots ratified a new contract in January 2016, which can be amended by mutual agreement. "We do not anticipate any disruption in service," said the statement emailed by Seattle-based Horizon. The increasingly stiff competition to recruit new pilots is a consequence of a commercial pilot shortage that affects the regional airline sector most strongly. Numerous forces are colliding to create the problem, including growth within the airline industry, low starting pay for pilots, tough work schedules and an anticipated wave of retirements from the major airlines. The majors then backfill by plucking pilots from regional carriers. The Federal Aviation Administration requires commercial airline pilots to retire at age 65. Then add to that, a big increase in the training requirements needed to get an air transport pilot license. That came from the FAA in 2013 in the wake of a commuter airline crash in upstate New York. A lot of commercial airline pilots used to come over from the Air Force too, but Horizon Air Director of Pilot Development and Recruiting LaMar Haugaard said the military does not train as many pilots as it used to. "Marry that up with fewer and fewer people getting into the industry -- mainly due to becoming cost-prohibitive on the training side -- you have a shortage that will come from that,” Haugaard said in an interview with public radio in October. “And we are certainly seeing that now." Both Horizon Air and its pilots union mention crew shortages as one factor in a spate of flight cancellations in December and early January. 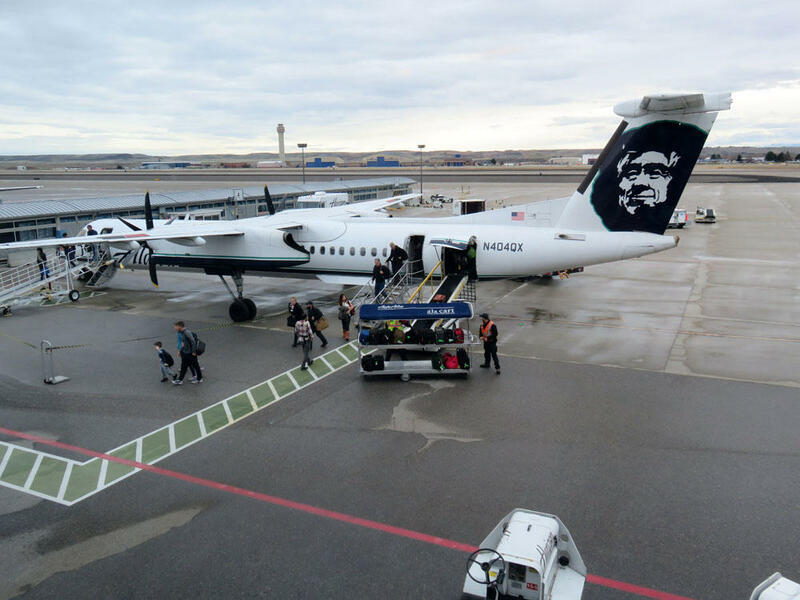 Horizon Air also raised the hackles of its pilots union by including recruiting incentives in partnerships it has signed with flight schools to expand the training pipeline. Last October the airline inked a pilot development agreement with Central Washington University's aviation department and in December it offered similar terms to aspiring pilots at Hillsboro Aero Academy in suburban Portland. Eligible aviation students on track to earn their commercial pilot certificates can receive a $7,500 stipend and a conditional job offer from Horizon Air in exchange for a commitment to fly for the regional airline for at least two years. Horizon Air currently employs about 675 pilots. Tuesday, local pilot and businessman Bill Hemme will be recognized by the FAA for his expertise in aviation. Hemme has maintained his status as a pilot for 50 years and is generally known to be expertly knowledgeable on the subject of aviation. 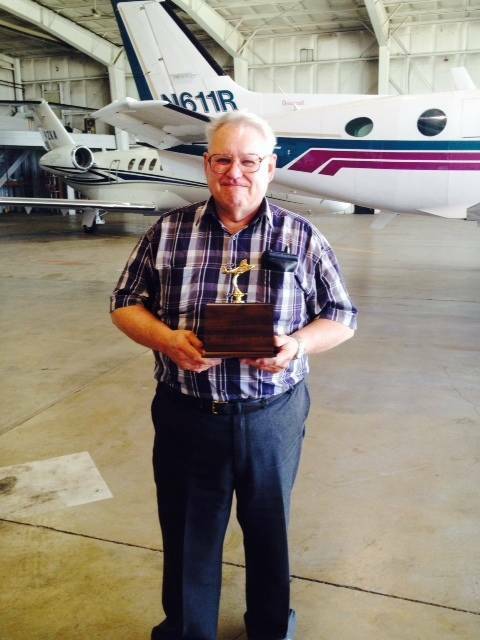 In 2015, Hemme (pictured with his trophy) received first place in a spot landing competition at Spencer Municipal Airport. Local pilot and businessman Bill Hemme will be awarded the Wright Brothers Master Pilot Award by Federal Aviation Administration Team Program Manager Chris Manthe. The award is given to pilots who have shown professionalism, skill and aviation expertise for at least 50 years. The presentation will take place at 6:30 p.m. Tuesday at the Spencer Municipal Airport, during the FAA Safety Seminar. 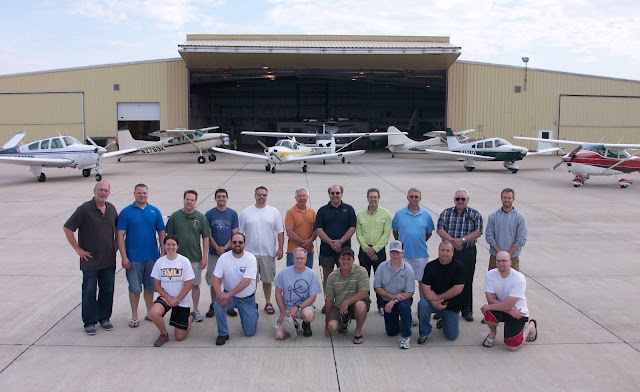 Hemme, who founded Spencer Avionics, which is located at the Spencer Municipal Airport, serves on the airport board and works alongside fellow aviators as well as representatives of Leading Edge Aviation. "Bill is an interesting guy. He has built the businesses of Spencer Avionics into quite a business over the years and, now that he's retired, it's still growing. So, he has a lot to take credit for," Gayle Brandt, with Leading Edge Aviation, said. The Spencer Municipal Airport hosted its first spot landing competition in 2015. Several pilots entered the competition. However, Bill Hemme (back row, second from the right) took first prize. Hemme will be recognized as a master pilot by the FAA on Tuesday. Hemme explained that after he graduated from Iowa State University in 1963 with a degree in electrical engineering, he began work at a company called Collins Radio in Cedar Rapids. During this time, his work contributed to the Apollo Space Program. Approximately two years after starting work, Hemme received his private pilot's license in 1965. After the Apollo program wound down, Hemme said he transferred to the commercial avionics division of the company. In 1971, Hemme took a job in Armstrong, at a company called Weightronix before starting Spencer Avionics in 1977 and eventually retired in 1999. "I ran the business for 22 years and then sold it to one of my 12-year employees and he continues to run the business," Hemme said, noting that he still works for the employee part time. Hemme went on to indicate that Spencer Avionics is one of only four such businesses in the state of Iowa that operate out of an airport. "Usually they're in large airports like Des Moines, Sioux City, the Quad Cities or Omaha, (Nebraska). As far as the state of Iowa, there's only four," Hemme said. Throughout his years, Hemme has continually maintained his pilot's license. "Keeping his pilot's license for 50 years says a lot. Beyond that, he makes sure he keeps himself current," Brandt said. Hemme explained that, in order to be eligible for the award, a pilot must have maintained his or her license for 50 years with no lapses, violations or accidents. "Your pilots license doesn't really expire. You retain it, unless you have a violation and the FAA pulls it on you," Hemme said. He went on to explain that a specialized doctor, called an airman's medical examiner, must conduct medical tests to be sure pilots are able to continue operating aircraft. He explained that the frequency of the examinations depends on the age of the pilot. "At my age, at 75, it's every year," Hemme said. Regarding Tuesday's presentation, Hemme seemed ready to accept his award with humility. "It's kind of a nice award," he said. "To tell the truth, not a whole lot of pilots make it to the 50-year threshold." He clarified that some pilots loose interest and others are no longer medically able to pilot a craft. Hemme, on the other hand, has been able to continue to develop his skill as a pilot. In fact, Hemme won the 2015 Spot Landing Contest at the Spencer Municipal Airport. "That was the first year we'd done that contest. He was the oldest guy there with the highest performing aircraft and he was the guy that had the most precision," Brandt recalled. Brandt went on to describe Hemme as a contentious pilot, who carries effective equipment in his plane and knows how to use it to its full potential. "He's very deserving of the award," Brandt concluded. The state has cut off funding to Newport News/Williamsburg International Airport while it conducts an audit of the airport after commissioners used $4.5 million to pay off a failed airline’s bank loan, Virginia Transportation Secretary Aubrey Layne said. The Daily Press first reported the Peninsula Airport Commission’s early 2015 loan payment on Thursday. The commission agreed in June 2014 to be on the hook for a $5 million TowneBank loan to the now-defunct airline People Express, or PeoplExpress. Layne said the newspaper’s story led him to check if the airport used state funds dedicated for capital improvements to pay off the loan. It did – about $3.5 million, according to a report the airport submitted to the state in October 2016, noting it was for “air service development,” essentially attracting new airlines or routes. Layne called that a significant amount of money and “significant breach” of state policy. He said the state typically gives the airport up to $2 million annually dedicated specifically for capital improvement projects. The airport’s executive director, though, said Friday that using the funds to pay off the loan was within the airport’s right, pointing to language in a three-page Airport Program Manual from Virginia’s Department of Aviation. In it, the manual states that if entitlement funds are used for projects “outside of normal expenditures,” including air service development, the state will deduct that amount from any future requests for state discretionary funds. Spirito said the remaining $1 million the airport used to pay off the loan came from a U.S. Department of Transportation grant and the Regional Air Service Enhancement Committee. The airport commission discussed the loan in closed session at its June 9, 2014, meeting and, in open session, voted to approve a resolution authorizing the commission’s chair “to do and commit any act ” to provide for the “adequate, economical, and efficient provisions of air service and general business” at the airport. Nowhere in the minutes does it note the commission agreed to guarantee a $5 million loan to PeoplExpress. No vote or discussion was held when the loan was paid off in February 2015. 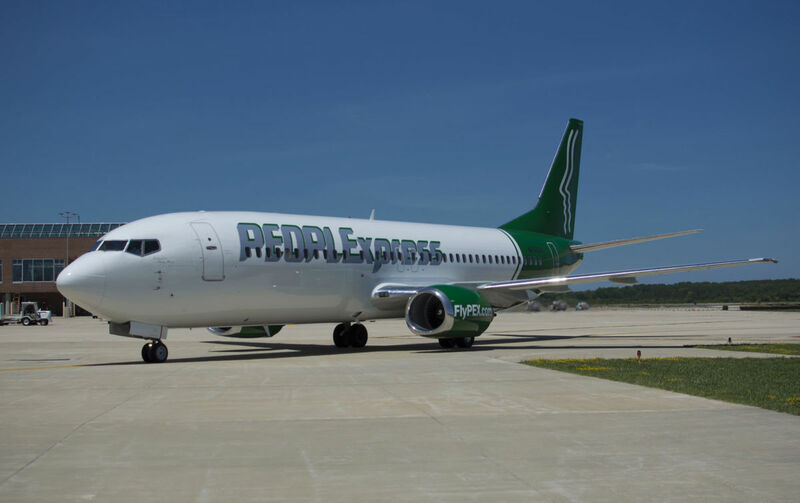 PeoplExpress, which flew to New York, Boston and a few other locations from the airport for a short time starting in mid-2014, stopped flying and was evicted by early 2015. An airport spokeswoman said 418,889 passengers used Newport News/Williamsburg in 2015. That same year, about 3 million people traveled through Norfolk International Airport and 3.5 million used Richmond International Airport. Spirito said airport operations won’t be affected by the state’s decision to stop funding while it investigates. As for state entitlement funds that might be in limbo, the airport had expected to receive about $600,000 by late spring, around the same time Spirito said he expects the audit to be resolved in the airport’s favor. “We will be found we were using these funds properly,” he said. Elite Airways had recently announced it would launch non-stop service between the Newport News/Williamsburg airport and New Jersey and Long Island starting in March. Elite spokeswoman Rebecca Ayers said the airline’s officials had just learned about the situation Friday and were talking with airport leaders. “The airline is not yet in a position to comment on what impact, if any, this will have on the planned service,” she said in an email. A pilot escaped injury Friday morning when his landing gear collapsed at Clearwater Airpark. 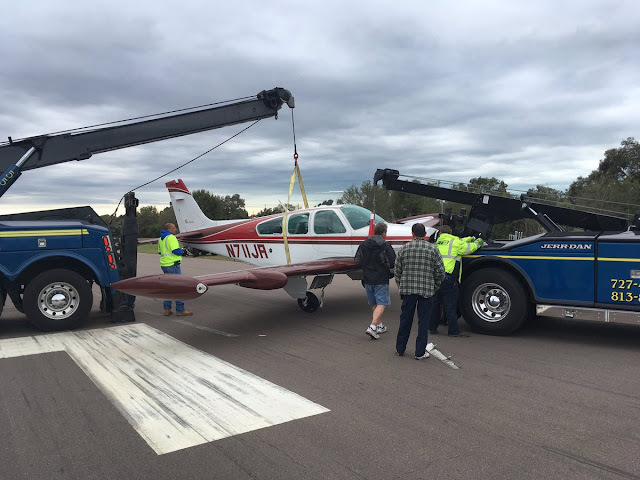 According to Clearwater rescue officials, the landing gear on the Beech F33A Bonanza plane collapsed upon landing at 10:45 a.m. at the airpark, at 1000 N Hercules Ave. The pilot, who was the only person on board, was not injured, officials said. 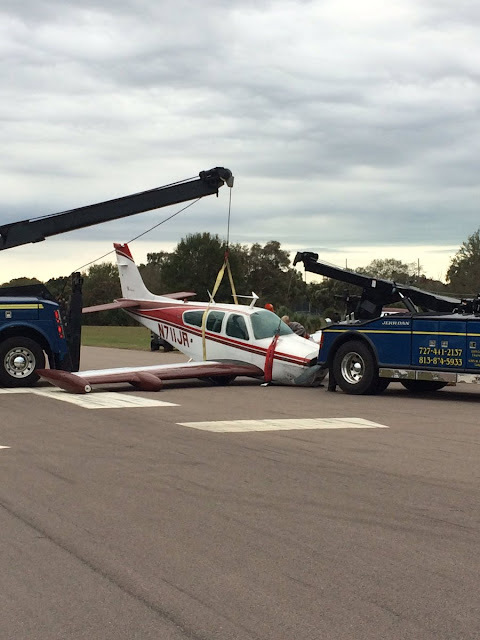 CLEARWATER, FL — A Friday morning emergency landing at Clearwater Airpark turned out about as well as can be expected under the circumstances, according to firefighters. Clearwater Fire & Rescue crews were called to the airport around 10:45 a.m. Jan. 27 "after the landing gear on a small plane collapsed upon landing," an email from the agency said. The pilot was the only one on board the Beech F33A Bonanza when the malfunction occurred, the agency noted. "There were no injuries to the pilot," the email said. No fuel leakage occurred either. Clearwater Airpark is a city-owned public facility located at 1000 N. Hercules Ave.
Further details about the emergency landing, including the pilot's name, are not yet available. On January 27, 2017, at 1750 eastern standard time, a Beech 200T, N60RA, was substantially damaged during landing at Palm Beach International Airport (PBI), West Palm Beach, Florida. 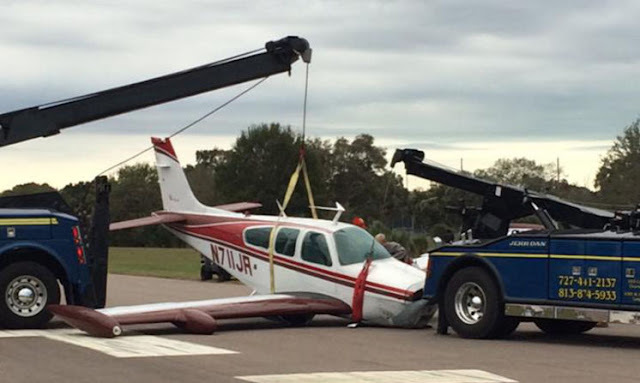 The airline transport pilot and a commercial-rated copilot were not injured. The airplane was registered to a private corporation and operated by Eastern Air Express under the provisions of 14 Code of Federal Regulations Part 91 as a positioning flight. Day, visual meteorological conditions prevailed at the time, and an instrument flight rules flight plan was filed. The flight originated at Treasure Cay, Bahamas (MYAT) at 1652. The pilot reported that the preflight and enroute portions of the flight were uneventful. The flight was established on the localizer for the approach to runway 28R, which was dry. Flaps were set to the approach position and the landing gear were extended and showed "3 green." After touchdown, he heard noises, and the airplane started to sink. After the airplane came to a stop on the right side of the runway, the pilots noticed that the gear handle was up. The pilot stated, "How did the gear handle get up?" He then placed the handle to the down position. The pilots secured the airplane and were met by first responders. An inspector with the Federal Aviation Administration responded to the accident site and examined the airplane. Structural damage to the fuselage was confirmed. All three landing gear were found in a partially extended position. Skid marks from all three tires were observed on the runway, leading up the main wreckage. Both propeller assemblies were damaged due to contact with the runway. The pressure vessel was compromised from contact with a propeller blade. The nose landing gear actuator was forced up, into the nose gear well and penetrated the upper nose skin. Examination of the landing gear components did not reveal evidence of a preexisting mechanical malfunction or malfunction. A 28-volt split-field motor, located on the forward side of the center-section main spar, extended and retracted the landing gear. The landing gear motor was controlled by a switch placarded "LDG GEAR CONT – UP – DN" on the pilot's right subpanel. The switch handle had to be pulled out of a detent before it could be moved from either the up or the down position. The pilot reported in a written statement that he went to bed around 2245 local on the evening prior to the accident and woke up around 0500 local. He also reported that he "was up several times" during the night to go to the bathroom. On the day of the accident, he flew 7 legs for a total of 5.2 hours. The only food he consumed that day was a banana for breakfast. The pilots reported that the preflight and en route portions of the flight were uneventful. The flight was established on the localizer for the approach to runway 28R, which was dry. Flaps were set to the approach position and the landing gear were extended and showed "3 green." After touchdown, they heard noises, and the airplane started to sink. After the airplane came to a stop on the right side of the runway, the pilots noticed that the gear handle was up. The pilot stated, "How did the gear handle get up?" He then placed the handle to the down position. The pilots secured the airplane and were met by first responders. An inspector with the Federal Aviation Administration responded to the accident site and examined the airplane. Structural damage to the fuselage was confirmed. Both propeller assemblies were damaged due to contact with the runway. WEST PALM BEACH, Fla. - A Beechcraft B200T Super King Air landed veered off runway at Palm Beach International Friday evening. Palm Beach County Fire Rescue is on scene investigating. No commercial airplane runways are impacted. 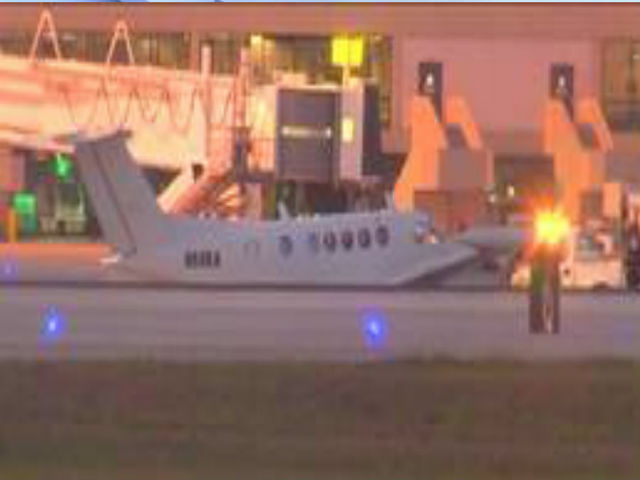 A small plane has skidded off the runway at Palm Beach International Airport. The Beechcraft B200T Super King Air went off the runway and is now surrounded by emergency vehicles. The pilot was forced to land without landing gear. There are no reports of any injures. 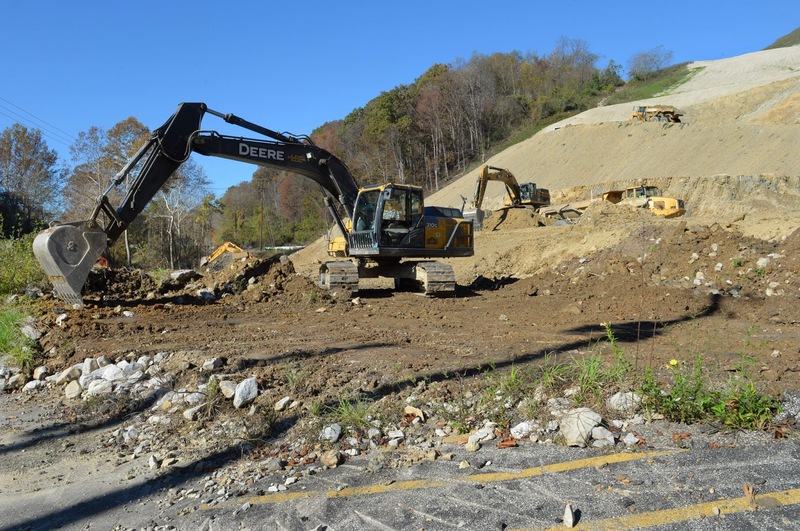 Workers use heavy equipment to clear landslide debris from Keystone Drive in this file photo from late 2016. Blocked to through traffic for 22 months after it was buried under some of the 540,000 cubic yards of earth and rock that sheared free from a 270-foot-high engineered fill structure supporting Yeager Airport’s safety overrun area, Keystone Drive is now cleared and awaiting action by the state Division of Highways to reopen. Terry Sayre, executive director of the Charleston airport, told members of its governing board on Wednesday that the DOH has surveyed the recently cleared roadway, a unit of the state highway system, and has installed new drainage culverts under its surface as well as beneath a nearby parking lot that served Keystone Apostolic Church, demolished by the March 9, 2015 landslide. Yeager Airport has spent about $4.1 million to clear debris from the slide, and about $500,000 more will be spent to remove the haul road on airport property used to dispose of most of the material involved in the collapse. About 9,000 cubic yards of material will be removed to take up the haul road, which connected the base of the landslide with a disposal site on airport property. “With two or three days of freezing temperatures or no rain, those 9,000 cubic yards should be gone,” Sayre said. Funding to pay for repairing and reopening the roadway is in hand, he said, since “the DOH has a FEMA (Federal Emergency Management Agency) grant to gravel and pave Keystone Drive,” he said. In other business, the airport board voted to spend $10,000 to sponsor and promote the final event in the 2017 Spartan Race Series to the Summit Bechtel Reserve in Fayette County on Aug. 26-27. About 25,000 people are expected to take part in the nationally televised event, which includes races, obstacle courses and other timed athletic challenges. Yeager Airport is partnering with the Charleston Convention and Visitors Bureau, the state Division of Tourism and National Travel to sponsor and promote the event. Buses will be provided to take contestants to and from the Charleston airport to the Boy Scouts’ 10,000-acre high adventure camp and National Jamboree site. Board members voted to increase Sayre’s salary from $131,000 a year to $150,000 annually, which matches the sum former Yeager director Rick Atkinson was paid when he resigned in 2015. KEENE — A group of Edgewood neighborhood residents filed a lawsuit against the city Thursday in an attempt to stop a Dillant-Hopkins Airport tree-cutting project. “Essentially it’s our position that the original restrictions which prevent cutting trees in the 12-acre parcel runs for the benefit of every property owner in the Edgewood neighborhood,” said Manchester attorney Roy W. Tilsley Jr., who is representing the group of 10 residents. A request for an injunction to halt the city’s plans to cut more than 2,000 trees was filed in Cheshire Superior Court. The tree cutting is part of a safety plan that is aimed at improving the sight lines for pilots landing at the airport. Some residents of the neighborhood, which abuts the airport, have long expressed concerns that the removal of the trees would lead to a significant increase in noise. The injunction asks that an approximately 12.3-acre woodland parcel abutting the airport be left alone. The parcel was deeded to the city from the Edgewood Civic Association in 1969 with a restriction prohibiting tree-cutting on the parcel. Tilsley said Thursday that while the Edgewood Civic Association lifted that restriction, the residents of the neighborhood never did, so the restriction should remain in place. “A controversy also exists regarding the validity of the Amendment, which was signed and recorded in 1983, given that the Association was administratively dissolved in 1977,” the request for an injunction said. “In seeking to cut trees on the Buffer Parcel, the City will violate the Deed’s restriction that such land be maintained in a natural and wooded state substantially in the same condition in which it was as of 1969. According to the court document, the airport’s manager Jack Wozmak has said tree cutting is to begin on Tuesday. Sandra Shore, the new manager for the Floyd W. Jones Airport, stands in front of the airport sign. Fifty years after the Floyd W. Jones Airport was christened, it is starting the next phase of its existence under a new manager this month. 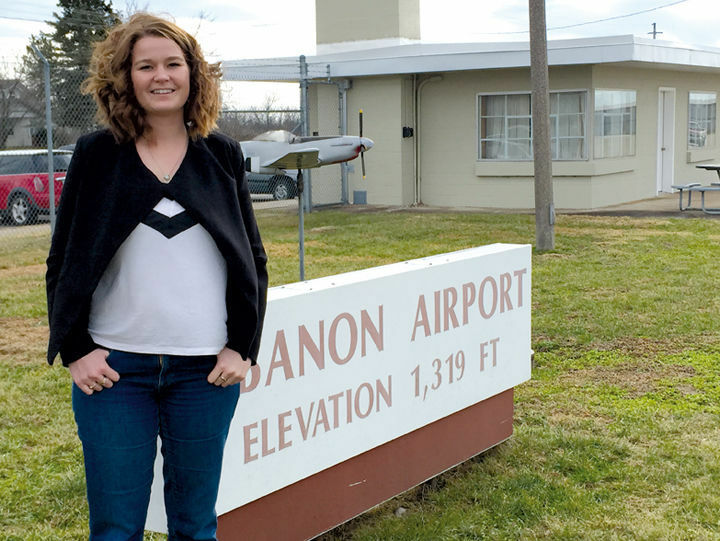 Camdenton native Sandra Shore began work as Lebanon’s airport manager in early January, and she said that she plans to focus on airport projects and community outreach. “There’s definitely a lot of room for improvements — pursuing different grants to get some construction on the airfield side and really kind of developing a good relationship with the community through different events, different opportunities,” Shore said. After graduating from Camdenton High School, Shore attended a community college in Alton, Ill., then transferred to Southern Illinois University to finish her undergraduate degree in aviation management. Like many people in the aviation field, Shore originally wanted to be a pilot. The pilot reported that, during the initial climb, he retracted the landing gear normally and then “a few minutes later the radios went blank.” He believed he had a radio problem, so he decided to return to the airport. During the return, the pilot moved the landing gear selector to the down position, but the three gear down indicator lights did not illuminate. Subsequently, the pilot circled a few miles east of the airport to troubleshoot the issue. According to a witness who owns a house on the airport property, he observed the airplane depart and about 5 minutes later, saw that the airplane had returned for landing. The witness reported that the airplane’s landing gear were retracted until the point at which the pilot began the landing flare over the runway. When the airplane was about 5 ft above the runway, each landing gear began to extend, but the airplane touched down before the nose gear and left main landing gear could extend fully. According to a Federal Aviation Administration (FAA) aviation safety inspector (ASI) who arrived at the accident site about 2 to 3 hours after the event, when he “switched the master switch on,” he observed electrical equipment turn on and heard the landing gear extension motor running. During a subsequent postaccident examination, the FAA ASI reported that he found no abnormalities with the electrical system. He also extended the landing gear to the down-and-locked position with the electric/hydraulic system and observed three green indicator lights illuminate. It is likely that the pilot failed to extend the landing gear for landing and that, as the airspeed slowed during the landing flare, the pressure sensing device automatically deployed the landing gear. However, due to the insufficient altitude and time, the landing gear were unable to fully extend and lock. The pilot's failure to extend the landing gear for landing. The pilot reported that during the initial climb he retracted the landing gear normally and then "a few minutes later the radios went blank." The pilot further reported that he believed he had a radio problem, so he decided to return to the airport. During the return, the pilot reported that he moved the landing gear selector to the down position, but the three gear down indicator lights did not illuminate. Subsequently, the pilot reported that he circled a few miles east of the airport to troubleshoot the issue. During the circling, the pilot reported that he "cycled the master switch and the radio master a couple times with no results." The pilot further reported that the airplane was equipped with an "automatic gear extension system," so he verified that the override switch was not engaged, fully extended the flaps, and slowed the airplane to 85 knots. Subsequently, the pilot believed the landing gear was down, so he returned to the airport for landing. During touchdown, the left main landing gear and nose gear collapsed (or were not extended) and the airplane veered off the runway into dirt, which resulted in substantial damage to the left wing. During a postaccident interview, the pilot reported that he believed he had "a total electrical failure." According to a witness who owns a house on the airport property, he observed the airplane depart and about 5 minutes later saw that the airplane had returned for landing. The witness reported that the airplane's landing gear were retracted until the point at which the pilot began the landing flare over the runway. The witness further reported, when the airplane was about 5 feet above the runway, each landing gear began to extend, but the airplane touched down before the nose gear and left main landing gear could extend fully. According to a Federal Aviation Administration (FAA) Aviation Safety Inspector (ASI) who arrived at the accident site about two to three hours after the event, when he "switched the master switch on," he observed electrical equipment turn on and heard the landing gear extension motor running. During a subsequent postaccident examination, the FAA ASI reported that he found no abnormalities with the electrical system. He also extended the landing gear to the down and locked position with the electric/ hydraulic system and observed three green indicator lights illuminated. According to the Pilot's Operating Handbook (POH) for the accident airplane, a "pressure sensing device" in the landing gear system will lower the gear "regardless of the gear selection position," pending that the override switch is not engaged. The POH further stated in part: "The gear is designed to extend at airspeeds below approximately 103 KIAS [Knots Indicated Airspeed] with power off even if the selector is in the up position. The extension speeds will vary from approximately 81 KTS [Knots] to approximately 103 KIAS depending on power settings and altitude." UPON LANDING RIGHT WING STRUCK GROUND AND AIRCRAFT VEERED OFF RUNWAY INTO GRASS. AT 2500 MSL, ON APPROACH RWY 34L AIRCRAFT STRUCK SINGLE LARGE BIRD CAUSING DENT IN NOSE AND DAMAGE TO ANGLE OF ATTACK INDICATOR. MESA FLIGHT 6176, IAD TO BNA. CREW OBSERVED FUEL LOSS DURING DESCENT AND DECLARED EMERGENCY. CREW OBSERVED N2 ENGINE FIRE WARNING LIGHT, PULLING FIRE HANDLE, THEN DISCHARGING FIRE BOTTLES. FIRE LIGHT WENT OUT. UPON LANDING, PASSENGER AND CREW EXITED VIA AIRCRAFT STAIRS ON RUNWAY. The solo student pilot reported that, after completing maneuvers in the local area, he returned to his home airport and was cleared for a straight-in approach. During touchdown, the nosewheel and propeller struck the runway hard, and the airplane bounced. During the second bounce, he increased power to abort the landing but was unsuccessful due to the damaged nosewheel and propeller. Subsequently, the student pilot stopped the airplane on the runway. The airplane sustained substantial damage to the firewall and fuselage. The student pilot's improper landing flare, which resulted in a bounced landing. The solo student pilot reported that after completing maneuvers in the local area, he returned to his home airport and was cleared for a straight-in approach. The student pilot further reported that during touchdown, the nose wheel and propeller struck the runway hard and the airplane bounced. During the second bounce, he increased power to abort the landing, but was unsuccessful due to the damaged nose wheel and propeller. Subsequently, the student pilot stopped the airplane on the runway. The student pilot did not report any preaccident mechanical malfunctions or failures with the airplane that would have precluded normal operation. If you’ve ever been swamped in the crush of incoming passengers and outbound travelers in the main lobby of Buffalo Niagara International Airport, that is about to change. And if your trip home was ever delayed by an antiquated baggage system with its stops, starts and breakdowns, that too soon will be improved. Much of how we view the Buffalo airport today will be transformed by 2019 through a $65 million renovation and reconfiguration that gets underway this fall. When completed, passengers leaving planes will walk through new exits in both east and west concourses. 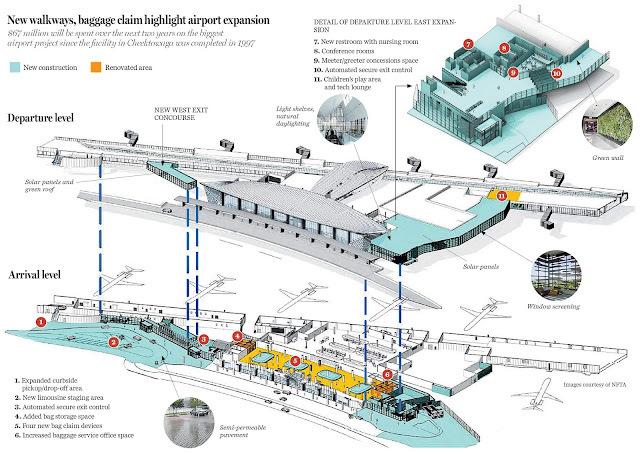 Air travelers also will discover state-of-the art baggage carousels on the lower level, eliminating the familiar flat conveyor belts, catapulting Buffalo into the ranks of the nation’s bigger and more modern airports. Guided by forecasts of increasing traffic fueled by local and Canadian air travelers, the Niagara Frontier Transportation Authority is embarking on a two-year airport construction period as the next step of a more than $400 million master plan that spans another 15 years. • New walkways curving around the main terminal’s east and west ends that provide direct access to escalators to ground floor baggage claims. • Four baggage carousels to replace three existing flat plate baggage belts, doubling capacity. • Expanded storage area for “lost” or delayed baggage awaiting claim by owners, eliminating the “sea of baggage” often clogging the lower level. • New curb space at both ends of the terminal, considered a premium at BNIA. • Relocating familiar concessions like the upper floor’s Lake Erie Grill. • A new internal traffic pattern eliminating the necessity of security escorts for visitors to airport offices. • A centralized play area for children, along with a tech center providing work space and cellphone charging. • A new and protected bus waiting area on the lower level. Regulatory approvals still lie ahead, but no real hurdles are expected, said Kimberley A. Minkel, executive director of the NFTA. Most of the project will be funded by passenger facility charges tacked onto each ticket bought at the airport along with NFTA dollars and a possible state contribution, she added. Buffalo airport numbers have fluctuated with the ebb and flow of Canadian customers, attracted by proximity, lack of congestion, attractive fares, ease of parking and other features. At the peak of cross-border travel in 2012, 5.2 million passengers used the airport. Even with a devalued Canadian dollar, just under 5 million passengers traveled through BNIA last year. While earlier surveys calculated nearly half of the airport customers originated in Southern Ontario, Vanecek says newer and more sophisticated methods now peg Canadian use at around 30 to 35 percent – still a significant portion of the customer base. The Canadian dollar is experiencing a slight uptick in recent weeks, Vanecek noted, and that means cross-border airport use will start creeping up too. “That’s a good signal, and good for us to do this work now while we’re not bursting at the seams,” Vanecek said. Even in down times, he added, BNIA must prepare for when the Canadian dollar’s value will send a steadier stream of travelers into Buffalo. The work also prepares for the possibility of nonstop flights by foreign airlines to BNIA, especially as some carriers express interest in mid-size Northeast airports to escape congestion in New York, Boston and Philadelphia. Minkel added that the project’s price tag grew by $17 million because of the increasing possibility of international flights and the need for the new walkway at the international arrivals area on the west concourse. The new exit walkways for deplaning passengers may be the most noticeable improvement coming. Travelers will now be rerouted away from the central terminal area into new passages leading to baggage claim escalators, with an expected relief from the congestion in front of the second-floor elevators. The new walkway structure for the west end will better accommodate international arrivals who must now walk outside to reach the baggage area after clearing Customs, Minkel said. Passengers exiting JetBlue and other planes on the airport’s east concourse will directly reach the main terminal and downstairs baggage claim along a foliage-lined path. “It will be very seamless for our customers,” she said. The new baggage system will offer advantages for air travelers. Airlines investigating new service won’t even begin negotiations unless airport operators can guarantee bags for waiting customers within 20 minutes of touchdown, Vanecek said. And the airport must plan for the not-so-distant day when airlines will graduate from small commuter planes to bigger craft with at least 90 seats. Bigger planes “mean a bigger rush and more stress on the baggage system,” he said. Plans now call for four carousels to replace the current three flat plates, with each carousel continuing about 1.5 times more capacity than a flat belt. The flat belts serve their purpose, Vanecek said, but bags slide off and the openings can present a security risk, prompting the Transportation Security Administration’s periodic checks that stop the belt. The new project represents the latest phase of a 20-year airport master plan originally pegged at $406 million but now expected to be higher. Over the last five years, the NFTA has increased parking capacity toward a 10,500 vehicle goal, added new gates and installed new doors, rest rooms and seating. Future projects include new taxiways, a centrally relocated fire and rescue station, and even a long-discussed overpass from the Kensington Expressway providing direct access to the airport. NFTA planners eventually forecast an airport facility capable of handling 8 million users a year.